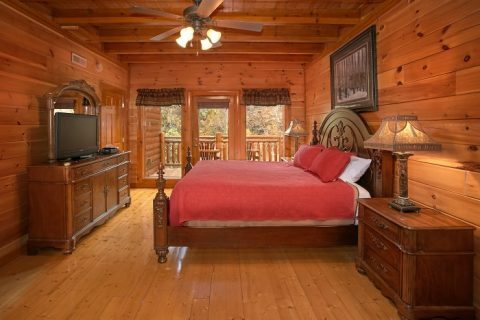 Experience the beauty and grandeur of the Smoky Mountains in a cabin that complements this gorgeous part of the country. 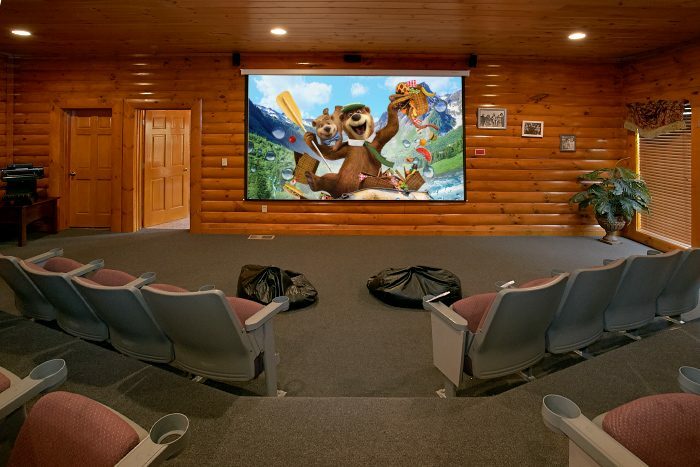 "Grand Theater Lodge" is a group cabin with a theater room nestled in the popular Black Bear Ridge resort area. 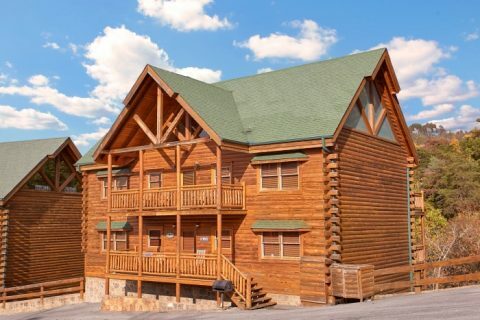 This rental's prime location only a short drive away from top-rated attractions ensures your group won't have trouble finding fun things to do on their vacation. 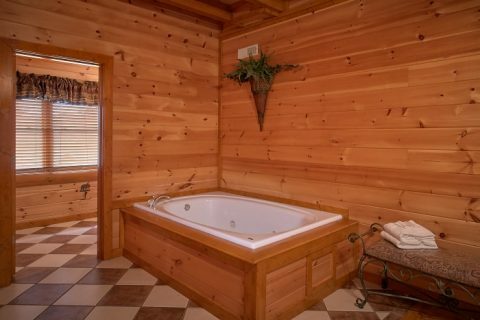 Better yet, you won't even have to step outside of your log cabin retreat to have a great time! 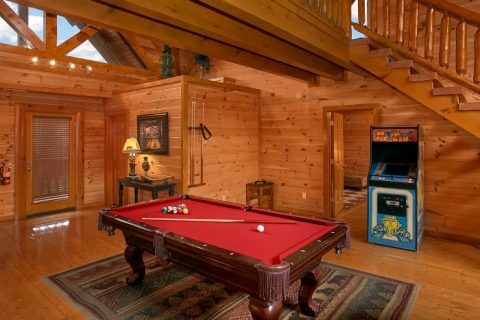 After all, this rental comes complete with a game room with a pool table and arcade games for hours of entertainment. 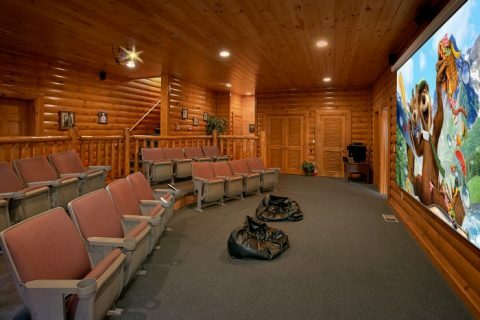 With this rental's large theater room, you can enjoy a quality movie theater experience complete with a large projector screen and authentic theater seats. 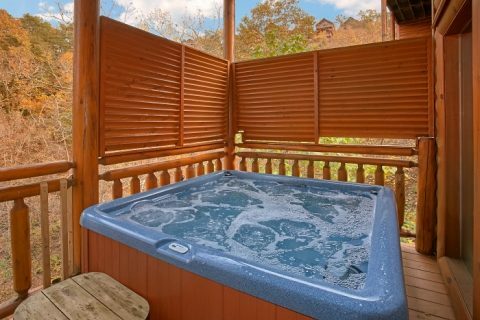 This rental also offers amenities for relaxation including a year-round hot tub and several in-room jacuzzi tubs. In the spacious living room area, you'll find a great space for spending time with the people who matter most. 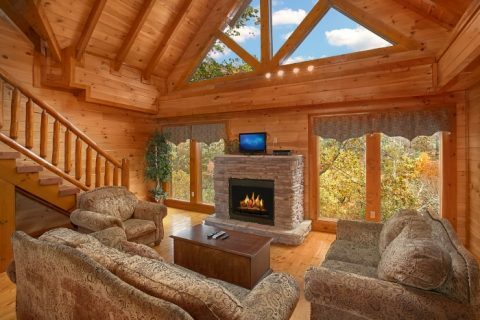 A stacked-stone electric fireplace makes this space warm and inviting while the large windows show off this rental's beautiful, forested location. 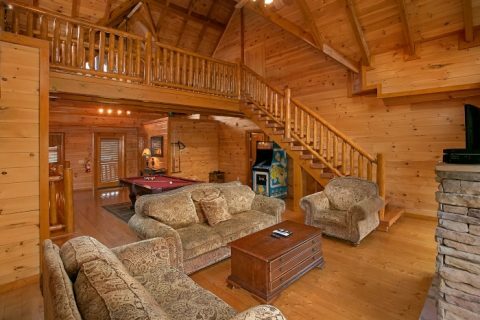 Your group cabin in the mountains also comes with practical amenities that can give you peace of mind during your stay. 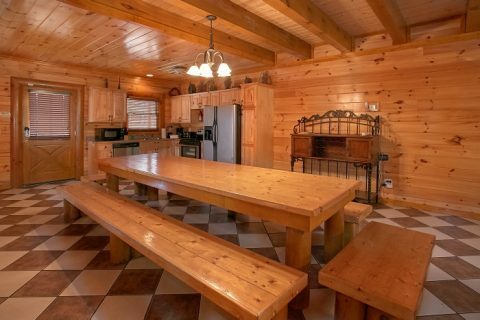 The full kitchen gives your group the option of dining in this comfortable cabin. 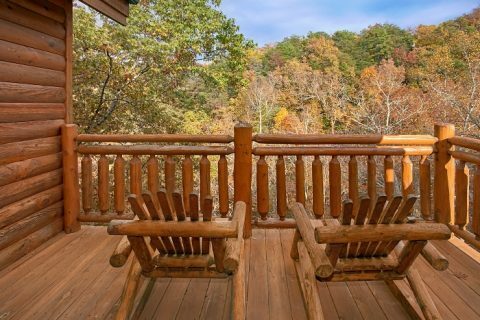 A charcoal grill is also provided if you'd like to have a cookout in the beautiful Smoky Mountains. 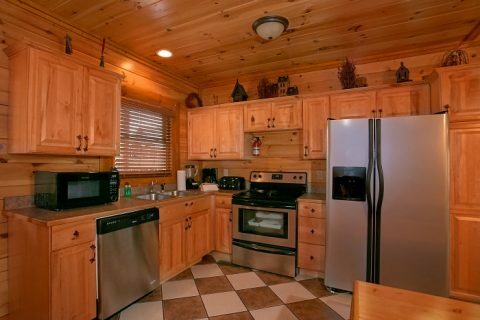 Lastly, a washer/dryer is provided so you can pack light for your stay in the Smokies. 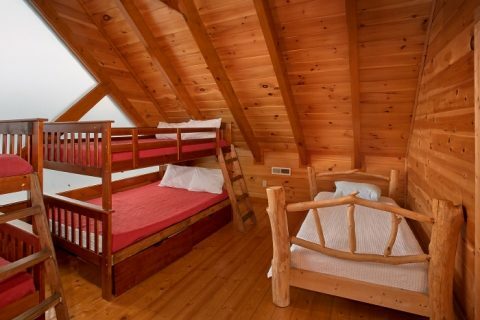 For getting a good night's rest, this group cabin in the mountains provides 8 private bedrooms. 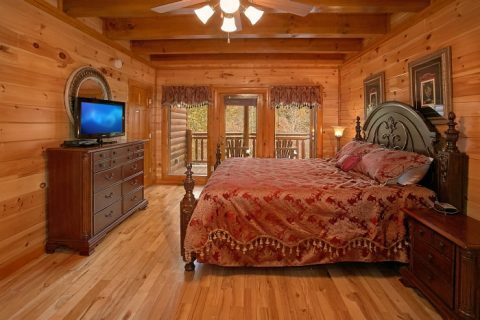 The main floor is home to two king-size bedrooms each with 32" flat screen televisions, jetted tubs, and private baths. 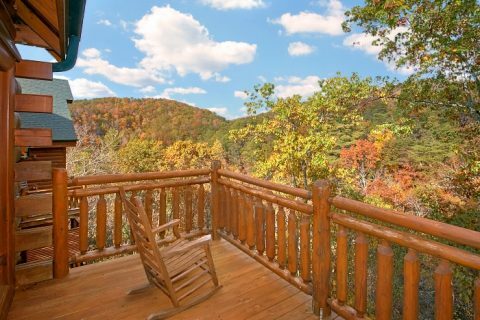 Each of these rooms provide access to private decks with rocking chairs for relaxing in the crisp mountain air. 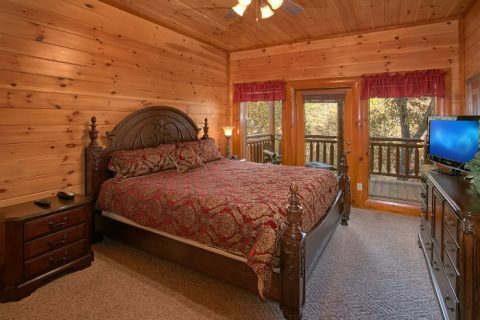 Upstairs, you'll find two more bedrooms with king beds, flat screen televisions and full baths. 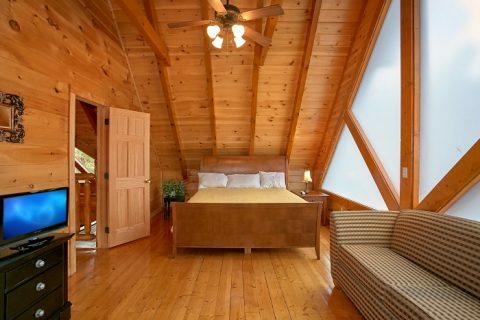 The top floor boasts even more sleeping space with two bedrooms. One king-size bedrooms provides a sleeper sofa and a flat screen television. 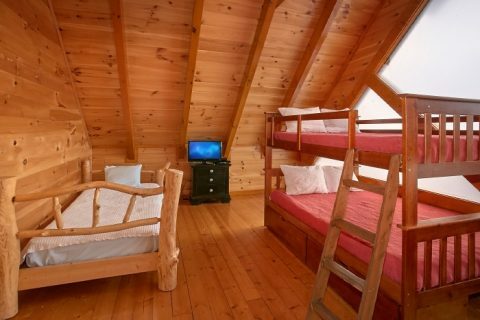 The last upstairs bedroom is perfect for the kids and features two full-size bunk beds and two twin beds. On the lower level with the theater room, there are two more bedrooms. 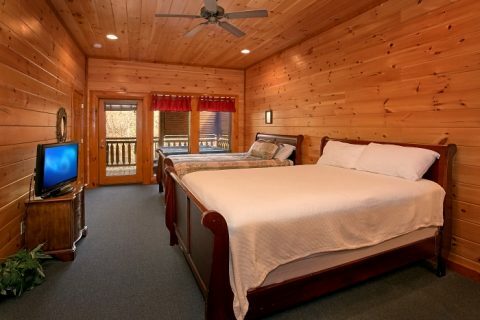 One room comes complete with two queen beds, while the other boasts a queen bed. 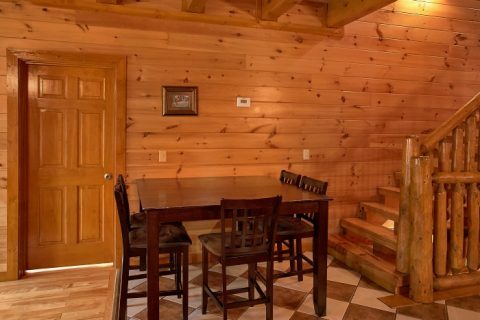 Both of these rooms have access to private decks, one with a hot tub and another with rocking chairs. Together with sleeper sofas in the living rooms, this rental allows you to comfortably accommodate up to 24 guests. 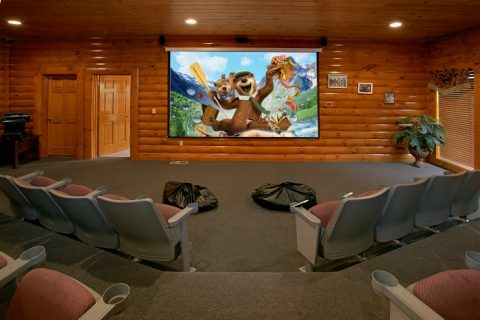 Book this group cabin with a theater room online today and save 15% today! 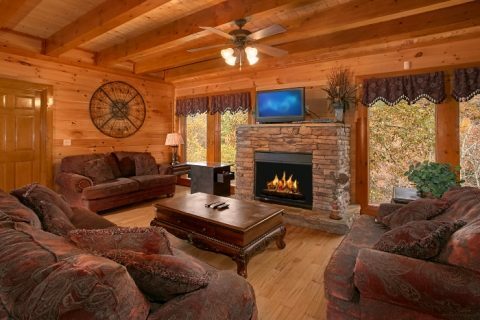 Earn a discount simply for reserving your cabin with Cabins USA Gatlinburg!